The eTrex Summit is small and it has only five buttons on the sides of the unit for easy operation and unobstructed view of the screen. The eTrex line also includes the basic eTrex, Camo, Venture, Vista, and Legend. All 6 eTrex units are in similar cases but vary in color. 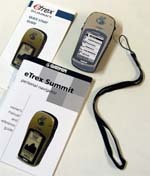 The eTrex Summit has map support for Garminï¿½s MapSource CDs. 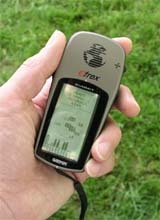 The Skyview Page displays the eTrex Summitï¿½s receiver status. It also shows the strength of the satellite signals that are being received. In the ï¿½Normal Skyviewï¿½ mode it displays (in animation) the satellites, satellite signal strength, and the estimated location accuracy. The ï¿½Advanced Skyviewï¿½ mode displays the satellites the eTrex Summit is locked onto, each satelliteï¿½s assigned number, their approximate position in the sky, and their individual signal strengths. The Pointer Page uses a compass to show your direction and travel speed. If you’re moving toward a specific destination, it shows the name of the location, the distance and time to go, and displays a direction arrow in the compass ring. With the simple press of one button, you can display additional information such as maximum speed, position coordinates, elevation, trip timer, trip odometer, time of sunrise and sunset, and bearing. This receiver has an electronic compass; it will give an orientation when standing still. The eTrex Summit has a feature called ï¿½Sight ï¿½N Go.ï¿½ It allows you to visually locate a landmark and lock its magnetic bearing. Once a bearing is locked you have the option of creating a projection waypoint or navigating along the locked bearing. The Elevation Page will provide you with the current elevation, rate of ascent/descent, and a profile of elevation changes over distance or time. You also have the choice to display a variety of data such as barometric pressure, vertical speed, maximum descent, maximum ascent, average descent, average ascent, total descent, total ascent, minimum elevation, maximum elevation, and 12 hour barometric pressure trend. The Menu Page allows you to access the more advanced features. From here you can manage waypoints, routes, and tracks. Found here is also the setup feature which allows you to customize the eTrex by changing coordinate systems, distance units, and map datums among other things. It is also where you calibrate the electronic compass and altimeter. The eTrex Summit is quite small, but not as small as Garminï¿½s Gekos. It has a band of rubber around the sides, top and bottom, giving a good grip and feel. The rubber-covered battery compartment door helps to resist sliding around on the dashboard or console when used in a vehicle. A bayonet-type latch makes access to the batteries easy. The manual says it will take up to five minutes to find the satellites when you use it for the first time. My test unit took 3:45 out of the box. Subsequent cold starts were about 45 seconds. During a 1.5 mile ï¿½neighborhood test walk,ï¿½ the eTrex Summit had an estimated location accuracy of as little as 19 feet. Marking waypoints and naming them for selected locations was simple. The ï¿½Gotoï¿½ feature is fundamental to a GPS receiver. After reaching the most distant point of my walk, and enabling ï¿½Goto,ï¿½ the screen displayed the direction I needed to go to reach my starting point. As I followed the indicated direction, the time to arrival and distance is also displayed. The distance is shown in miles down to one-tenth of a mile, then switches to feet (if units has been set to statute). Upon arriving at my starting point, the distance remaining was within 30 feet of being accurate ï¿½ pretty good for a 1.5 mile walk. Another useful function is the ï¿½TracBack.ï¿½ On a separate test I walked to a certain point, then enabled the TracBack on the eTrex Summit. This allowed me to retrace my route back to the beginning. The compass arrow was fairly accurate in guiding me to my starting point. A handy feature was the screen displaying ï¿½approaching turnï¿½ when I got close to a point where I needed to make a distinct turn. Testing the eTrex Summit under moderate foliage cover and next to 60-foot sheer cliffs showed that it was noticeably affected by these conditions. It usually maintained a lock on enough satellites for proper navigation. However, it did lose its signal on several occasions. As one of the eTrex models, its small size can be a plus. However, the small screen size is the price you pay for that. Keep in mind the eTrex Summit does not support maps so if thatï¿½s what youï¿½re looking for, youï¿½ll need to consider a different model. The electronic compass uses extra battery power, so you may want to turn it on only when necessary. It costs a little more than the basic models, but the price is probably worth it ï¿½ you get some extra features like a true compass and barometric altimeter.